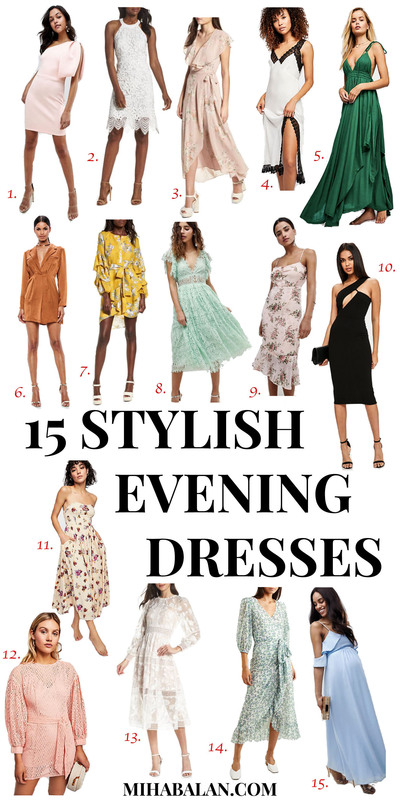 Whether you are looking for a dress to wear to an evening event or as a guest to a wedding party, you’ll need an evening summer dress and these are my personal picks of what to buy now. As I am soon leaving for my holiday to L.A. and Las Vegas, I’ve been thinking about the best way to dress for an evening night out. Something that doesn’t take a lot of time to style or lots of space in my huge luggage and still makes me look fabulous. Dresses, right? Day dresses, casual dresses, skater dresses. So many dresses for so many occasions but for today I will focus on the evening dress in particular. The hunt for the best evening dresses can be quite a challenge, but it’s a challenge that I am happy to accept as I get to enchant my eyes while browsing these beautiful evening dresses that I prepared for you below. My first pick of dresses is a very dramatic one, as my boyfriend likes to call it, a silk black wrap dress from HERE. So far, as you can see from the photos, I only paired it with a red rose but of course a black clutch or any other colour would fit well as an accessory for this dress. An old tip taken from Marieclaire.co.uk says that when choosing an evening dress you should show you arms or legs but not both together. While black dresses and sequin dresses are some of the most popular choices when it comes to evening dresses, I thought I’d experiment a little bit with different shapes, colours and prints, what do you think? If you are looking for Bold Statement Earrings to accessories these stylish dresses, find my personal picks HERE.